Use the IF function and an empty string ("") in Excel to check if a cell is blank. You can also use the IF function and the ISBLANK function. Remember, the IF function in Excel checks whether a condition is met, and returns one value if true and another value if false. 1. The IF function below returns Yes if the input value is equal to an empty string (""), else it returns No. Note: if the input cell contains a space, it looks blank. However, in this case, the input value is not equal to an empty string. As a result, the IF function above returns No. 2. The IF and the ISBLANK function below produce the exact same result. Note: the ISBLANK function returns TRUE if a cell is empty and returns FALSE if a cell is not empty. If the input cell contains a space or a formula that returns an empty string, it looks blank. However, in this case, the input cell is not empty. As a result, the ISBLANK function returns FALSE and the IF function above returns No. In Excel, <> means not equal to. 1. The IF function below multiplies the input value by 2 if the input value is not equal to an empty string, else it returns an empty string (""). 2. The IF, NOT and the ISBLANK function below give the exact same result. 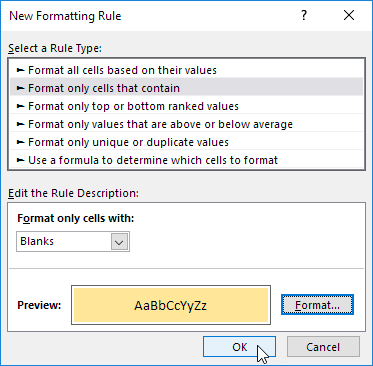 You can use conditional formatting in Excel to highlight cells that are blank. 1. For example, select the range A1:H8. 3. Click Highlight Cells Rules, More Rules. 4. Select Blanks from the drop-down list, select a formatting style and click OK. 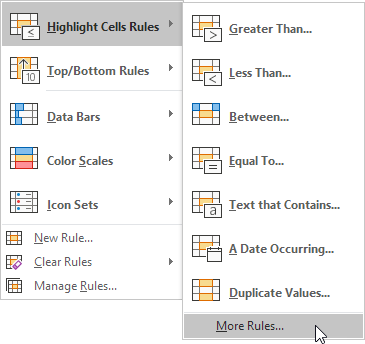 Note: visit our page about conditional formatting to learn much more about this cool Excel feature.